Such beautiful shoes. So hard to choose. Really lovely. The Shala Platform would work for me. So gorgeous. Wish I could have the Miu Miu's. Awesome! Such a great find you've found today. Beautiful shoes! But the price would still be out of range, even for the more inexpensive one. These are so fun! I'd choose Shala for me! both are cute. why not get it for less? Am going to go check out Endless right now! Happy new year dear! I prefer the Miu mius here, but they are both fun pairs of shoes! They look so similar, I'd take the inexpensive ones. Hot to trot! I just love that heel on the Miu Miu one. Love it! The Jean Michel Cazabat shoes look better to me, so I would definitely buy those. These shoes are gorgeous! I'll gladly give 1/2 inch to save $300! I hope your 2012 is off to an amazing start! Love both of them. Can't go wrong with black peep toes! Both look sooo stylish. It will be a matter of comfort for me. Yikes, I'd have to take a pass on those high heels! 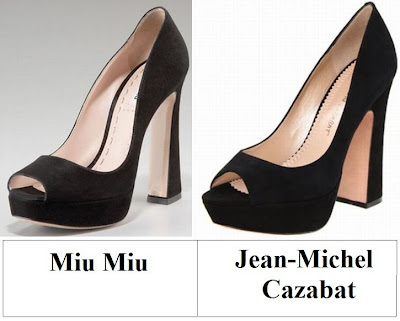 I have to say I like the Jean-Michel pair better! Love these styles -- they'd be SO versatile! love these shoes! either pair would be gorgeous! i would like to save some cash, though! i would go with the cazabat!! happy new year!! I really like your blog and all the post you have done, really cool name to the blog as well, would you like to follow each other? What a gorgeous heel. I'm definitely going for the thrift option though! Totally gorgeous. If I had them, I'd probably keep them under glass or something. Those are cute! I wear my current black peep toe pumps a lot! Nothing can beat out my beloved Miu Mius! I had some Banana ones similar but not with this very cool heel! Happy New Year and I'm so looking forward to reading your blog posts in 2012! Love these, the shape of the heel is so fab! I would snag those Cazabats! Great find Erika! But prefer the Miu Miu's in this case. You can have a look at these stunning and chic wedge sneakers at http://www.upere.com/upere-wedge-sneakers-c-1.html.